Storm 10 at times: the view from the Obs this morning (photo: Ciaran Hatsell). After the excitement of the White’s Thrush on 4th, things quietened down on 5th, with lingering scarcities including a Bluethroat and 2 Yellow-browed Warblers and a fresh southerly breeze not encouraging that many migrants, although 40 Whooper Swans were impressive and a Slavonian Grebe off Hjukni Geo was the first of the year. A very strong SE wind on 6th made birding difficult, with severe gale force winds later in the day being accompanied by rain, but it was obvious that birds were coming in and the day finished with high counts including 570 Song Thrush, 293 Redwing, 36 Goldcrest and 25 Robin, whilst highlights included 2 Little Buntings, a Dotterel (with the Golden Plover flock on Lerness) and some decent wildfowl movement that included 2 Pochard (a rare bird on Fair Isle, with less than 60 records) and the first Scaup of the year (a smart male in the Havens, that then appeared on the cliffs of Easter Lother). After first being seen in the Havens, it's possible that this bird was maybe attacked by Bonxies, forcing it onto the atypical habitat of the cliffs. What was very possibly the same bird was present on 7th off Hjukni Geo. A Long-tailed Duck seen on Suka Mire and Easter Lother on 7th was also a species in less than expected habitat. (photo: Ciaran Hatsell). The 7th opened with the promise of birds to come, but it was clear that it would have to wait as the driving rain continued and the SE winds were absolutely lashing the island, reaching Storm 10 and making walking pretty difficult, let alone birding. 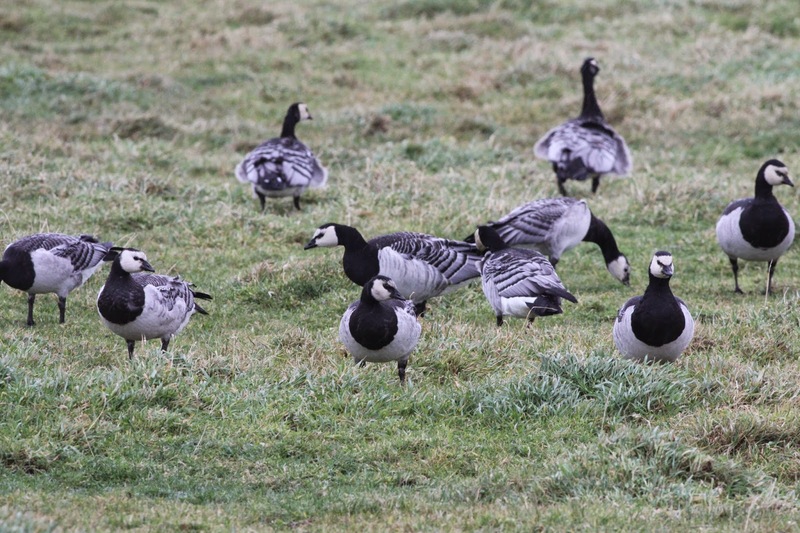 We did manage to get a bit of goose scanning in and picked out 4 Barnacle Geese darvic rings (which are likely to be birds ringed in Svalbard, but we’ll update you on those later), amongst the 139 Barnacle Geese, with 490 Pink-feet and 94 Greylag also present, along with 22 Whooper Swans. The Barnacle Geese have remained relatively settled below Shirva for a couple of days, allowing good opportunities for scoping them. The rain eventually cleared at about 3pm, the wind eased slightly (30mph+ still wasn’t exactly calm) and a frantic dash around the census areas as the light began to fade saw the slightly more sheltered west cliffs heaving with birds, although viewing was still difficult. An Olive-backed Pipit put in a brief appearance at Hjukni Geo, a Little Bunting roamed south east and other highlights included a late Quail, a Yellow-browed Warbler at the Obs, the Dotterel (which flew south down the island), Hen Harrier, Lapland Bunting, Long-eared Owl and both Pochard still present on Da Water. It was the number of birds that was most notable though as, even allowing for the conditions, Log totals included 864 Song Thrush, 346 Redwing, 72 Brambling, 32 Robin, 22 Blackbird, 15 Siskin, 25 Woodpigeon, 19 Jack Snipe, 59 Snipe, 10 Woodcock (the first of the autumn), 9 Reed Bunting, 5 Dunnock, 3 ‘North-western’ Common Redpolls and single Jackdaw (the first of the autumn) and Fieldfare. Not bad! 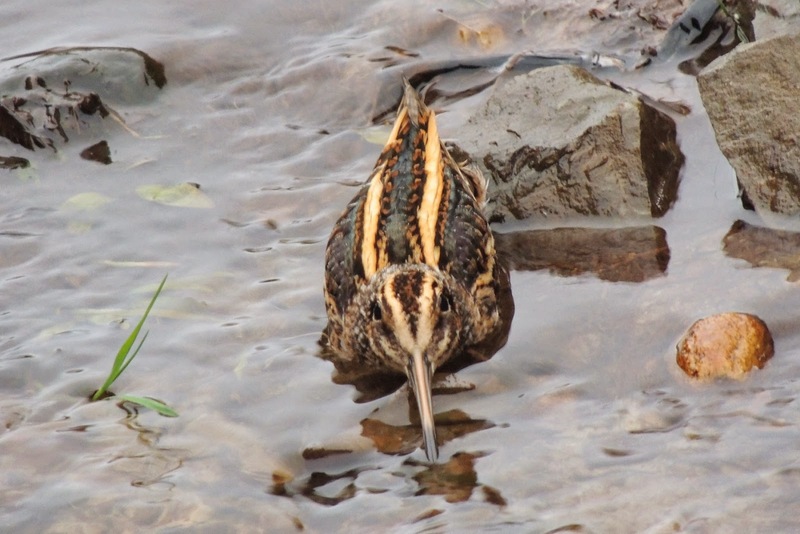 Good numbers of Jack Snipe were seen today, but getting good views was another matter altogether, so well done to Ciaran for this picture. Having warned at the previous evening’s Log that we could expect almost anything to turn up with the current weather, it was still a surprise to receive a call from John Day (a friend from my days working at the Lodge back when it were all nowt but trees) late in the afternoon saying he’d just seen a Barn Owl. What’s more his description (‘in the field with the Barnacle Geese and the two cows’) meant it was right behind me as I had just started to walk up Malcolm’s Head. I turned round and started getting the news out and, as I was doing so, it flew from the burn and headed towards me, flopping regularly into the grass. It spent some time out in the open before dropping into Steensi Geo, where it appeared to roost on the cliffs. An amazing record and well worth the pint I owed John for adding a species to my Fair Isle list. With just five previous records, this is a major Fair Isle bird. The fact that they all occured between 1924 and 1958 (and the last three were all seen by the same person) means that it ranks pretty high on the 'most-wanted' list of staff and islanders for those species on the Fair Isle list and it attracted a reasonable twitch. Interestingly, all bar one of the previous records was also an alba-type white-breasted bird rather than the perhaps more expected dark-breasted guttata. 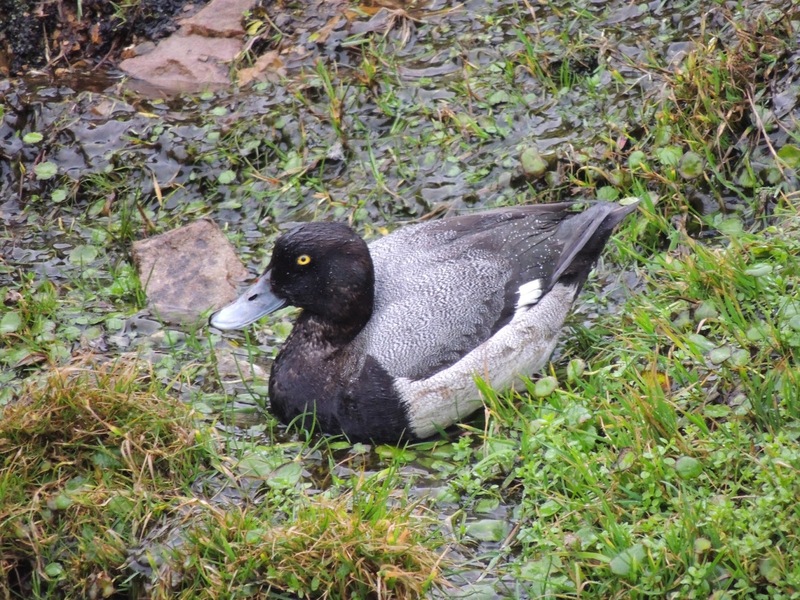 It really is a bizarre and sensational record, but where has this bird come from? 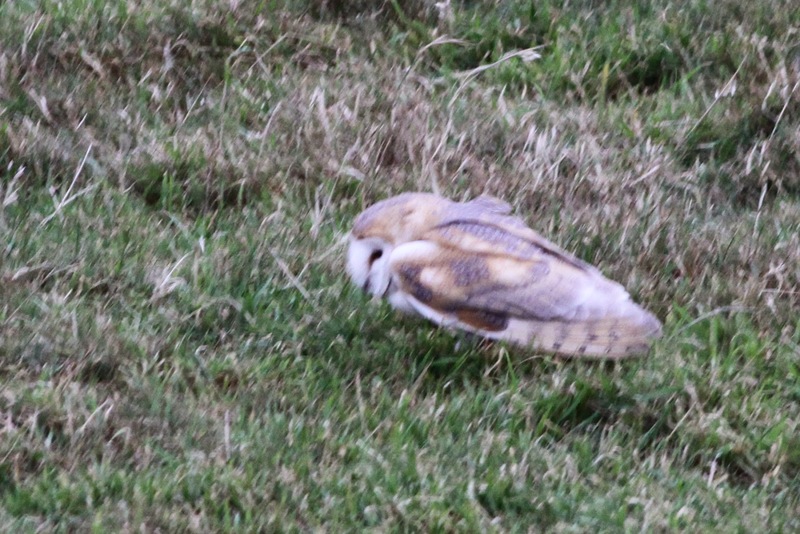 Amazingly, one of our guests had given a talk on Barn Owls on Sunday evening. I'm not sure if it's the first talk on that subject in FIBO's history, but the remarkable coincidence of the occurence of this bird so soon after has led to calls for a talk on Siberian Blue Robin soon! 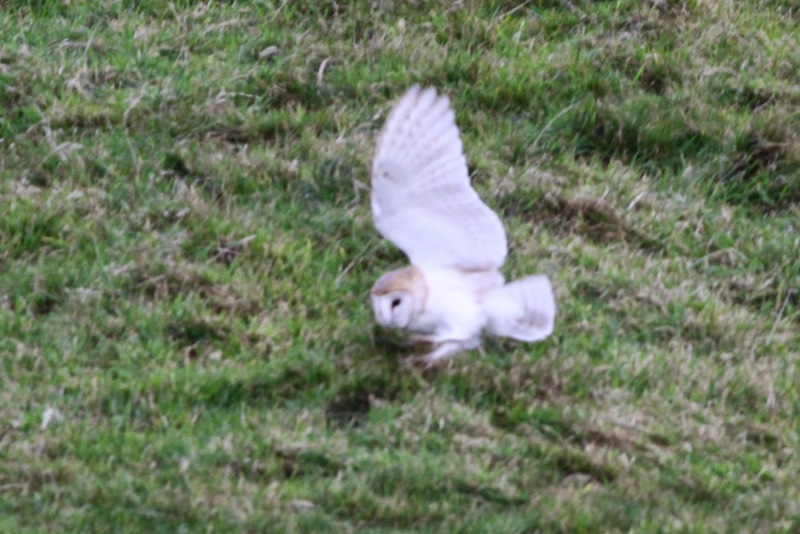 As a postscript to the amazing Barn Owl story, as I was sat at the base of Malcolm's Head keeping an eye on the owl as it sat in the field in front of me, a large flock of Pink-feet went up having seen approaching 'twitchers'. I swung my camera round, managed to get one in-focus shot of the flock and then went back to keeping an eye on the owl. 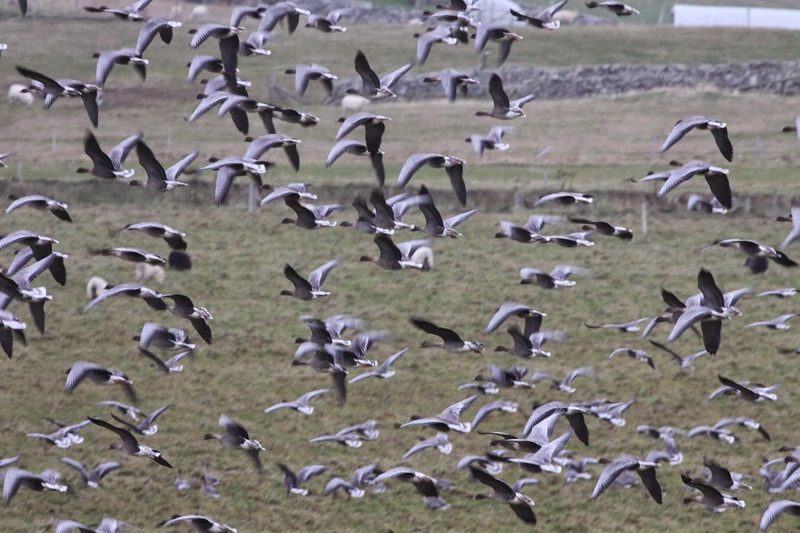 It was only when looking at the photo back in the office that I noticed that there seem to be three Tundra Bean Geese in the shot! Can you spot them? Thanks Tom. Thankfully we saw them the next day as well, which will at least mean we can flesh out the description a bit!